History was made when the first 0.5ha of commercial Pinotage vineyard was planted at Horsham in Sussex in England last week. These vines were planted at Leonardslee Lakes and Gardens, a sister property of the Benguela Cove Lagoon Wine Estate outside Hermanus in South Africa. Penny Streeter OBE, the Cape Town-based British entrepreneur, is creating a new wine farm experience at the 200-acre estate. The site features woodland gardens planted in 1801 which will open to the public in January 2019 following extensive renovation work. 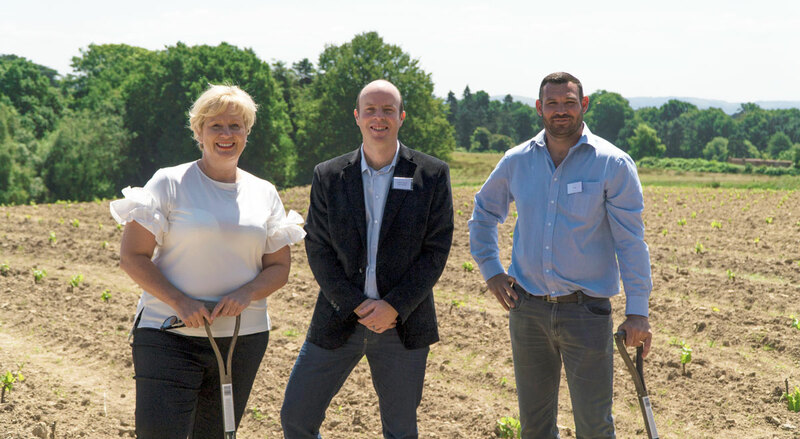 The new plantings brings the total of vines under cultivation to 66,000 across 16ha at Leonardslee and a second site, three miles away at Mannings Heath, where a vineyard was planted in 2017 to create the UK’s first golf and wine estate. Total UK production is projected at some 100 tons, 75,000 bottles of sparkling wine annually and now a non-sparkling Pinotage. The first crop is due in 2020 and first release of wine in 2023. Johann Fourie, previously of KWV, was appointed in 2016 as cellarmaster for Benguela Cove and for the UK vineyards, where he is working with viticulturist Duncan McNeill.